Dubai, UAE (November 1, 2018): A brand new swimming pool facility at Foremarke, Dubai’s Prep School located at Dubai Science Park, has been officially inaugurated by the UAE’s first female Olympic Swimmer, Nada Al Bedwawi. Pupils, teachers, parents and friends of the school gathered to mark the opening of the six- lane, 25 metre outdoor pool and its adjoining learners’ pool, which lie adjacent to the school’s football pitch and boast an impressive two-storey viewing gallery. Nada, who was welcomed by Headmistress, Zoe Woolley, made a motivational address at the event and impressed the important role that school swimming lessons play in encouraging competition within the sport. Nada competed at the 2016 Summer Olympics in the women's 50-metre freestyle event and was the first female Olympic swimmer from the United Arab Emirates and the country's flag bearer at the Parade of Nations. She is currently studying at Mohammed Bin Rashid University of Medicine & Health Sciences in Dubai, and is taking a leading role in raising the profile of competitive sports for women across the Middle East as the region has been traditionally under-represented. 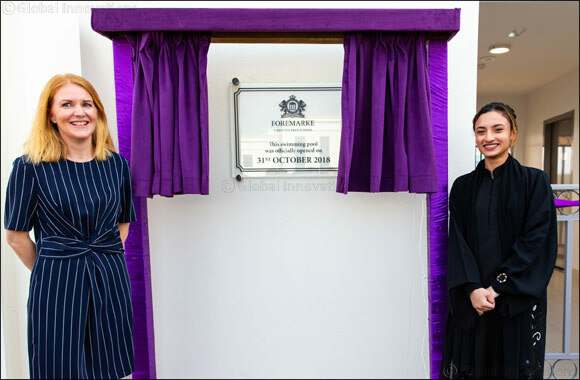 Following her motivational address, Nada unveiled a plaque commemorating the official opening and cut a ribbon on the entrance to the pool, before guests were treated to a synchronized swimming demonstration by members of My Sports. Later, Foremarke pupils marked the occasion by taking part in an enthusiastic swimming competition. The new swimming pool facilities are part of a recently completed development project which also incorporates a new dining hall & outdoor football pitches. The school was established just four years ago and boasts a range of world class amenities, including dedicated science labs, language rooms, art workshops, and music and drama studios. In addition to the new swimming pools, sports facilities at Foremarke encompass cricket pitches, tennis and netball courts and numerous indoor and outdoor multi-purpose Halls and areas.